Why Hire a Certified Arborist? Kraft Tree Service is a very professional company. From returning phone calls, to providing estimates, to the actual tree removal, they were timely and expert in everything they did. It was a pleasure working with Roger and Susan Kraft and their staff. When a tree is lost to storm damage, unsuccessful tree repair or insect infestation, it often becomes necessary to remove the tree completely. In other cases, tress must be removed for new construction and structure expansions. Whenever a tree is removed, the stump can quickly become an eyesore or obstacle that should be removed as well. 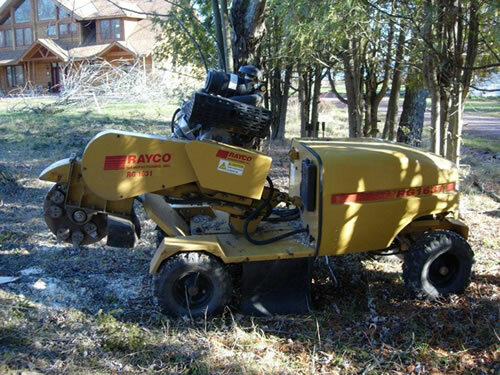 Unlike other MN tree services, we have the ability to remove stumps quickly and completely, leaving your property looking as though a tree never stood in the way. Unfortunately, it may not be possible to remove all stumps through conventional means; stumps that are too close to underground utilities, not accessible by stump grinder or too close to a foundation or concrete may cause significant problems during the stump grinding process. Need a stump removed? Contact a highly experienced stump removal service. If you have a stump that is blocking your path or impacting the beauty of your property, within the west Twin City suburbs including, Minnetonka, Lake Minnetonka, South Lake Minnetonka, Excelsior, Shorewood, Wayzata, Deephaven, Chanhassen, Hopkins, Eden Prairie, Orono, Greenwood, St. Louis Park, Edina or Eden Prairie, call Kraft Tree Services at 1-866-TIP-TREE / 952-406-8788 today.